Animated map showing the continents according to various models. Eurasia is often subdivided into Europe and Asia (red shades), while North and South America are sometimes recognized as one American continent (green shades). A continent is one of several large landmasses on Earth. Seven areas are commonly considered as continents: Asia, Africa, North America, South America, Antarctica, Europe, and Australia. However, they are generally identified by convention rather than any strict criteria. Some geographers divide the world into six, five, or fewer continents. The term "the Continent" (capitalized)—used predominantly in the European isles, such as the British Isles, Sardinia and Sicily—means mainland Europe, although it can also mean Asia when said in Japan. The geological process and study of the movement, collision and division of continents, earlier known as continental drift, is known as plate tectonics. Geologists believe that the continents were once one huge landmass, an idea with conforms with the belief that the earth itself is indivisible except conceptually and that humankind will one day achieve unity in a world of peace. Continents may be defined as "large, continuous, discrete masses of land, ideally separated by expanses of water." However, some of the seven most commonly recognized continents are identified by convention rather than adherence to the ideal criterion that each be a discrete landmass, separated by water from others. Likewise, the criterion that each be a continuous landmass is often disregarded by the inclusion of the continental shelf and oceanic islands. Geologists believe that there once existed on Earth one huge landmass which separated into the areas known today as continents. Similarly, the Earth's major landmasses today are actually washed upon by a single, continuous World Ocean, which is divided into a number of principal components by the continents and various human conceptual criteria. The narrowest meaning of continent is that of a continuous area of land or mainland, with the coastline and any land boundaries forming the edge of the continent. In this sense the term continental Europe is used to refer to mainland Europe, excluding islands such as Great Britain, Ireland, and Iceland, and the term continent of Australia may refer to the mainland of Australia, excluding Tasmania. The Arctic continental shelves, in light blue, encompass many coastal islands. Similarly, the continental United States refers to the 48 contiguous United States in central North America and may include Alaska in the northwest of the continent (both separated by Canada), while excluding Hawaii in the middle of the Pacific Ocean. From the perspective of geology or physical geography, a continent may be extended beyond the confines of continuous dry land to include the shallow, submerged adjacent area (the continental shelf), as they are structurally part of the continent. From this perspective the edge of the continental shelf is the true edge of the continent, as shorelines vary with changes in sea level. Coastal islands may thus be considered as part of a continent. In this sense the British Isles are part of Europe, and both Australia and the island of New Guinea together form a continent (Australia-New Guinea). As a cultural construct, the concept of a continent may go beyond the continental shelf to include oceanic islands and continental fragments. In this way, Iceland may be considered part of Europe and Madagascar part of Africa. Extrapolating the concept to its extreme, some geographers take Australia, New Zealand and all the islands of Oceania to be equivalent to a continent, allowing the entire land surface of the Earth to be divided into continents or quasi-continents. The ideal criterion that each continent be a discrete landmass is commonly disregarded in favor of more arbitrary, historical conventions. Of the seven most commonly recognized continents, only Antarctica and Australia are actually separated from other continents. Several continents are defined not as absolutely distinct bodies but as "more or less discrete masses of land." Asia and Africa are joined by the Isthmus of Suez, and North and South America by the Isthmus of Panama. Both these isthmuses are very narrow in comparison with the bulk of the landmasses they join, and both are transected by artificial canals—the Suez Canal and Panama Canal, respectively—which effectively separate these landmasses. The division of the landmass of Eurasia into the separate continents of Asia and Europe is an anomaly with no basis in physical geography. The separation is maintained for historical and cultural reasons. An alternative view is that Eurasia is a single continent, one of six continents in total. This view is held by some geographers and is preferred in Russia, which spans Asia and Europe. North America and South America are treated as separate continents in much of Western Europe, India, China, and most native English-speaking countries, such as the United States, Canada, Australia, and New Zealand. Furthermore, the concept of two American continents is prevalent in much of Asia. However, in earlier times they were viewed as a single continent known as America or, to avoid ambiguity with the United States of America, as "the Americas." North and South America are viewed as a single continent—one of six in total—in Iberia, Italy, Israel, some other parts of Europe, and much of Latin America. When continents are defined as discrete landmasses, embracing all the contiguous land of a body, then Asia, Europe and Africa form a single continent known by various names such as Africa-Eurasia. This produces a four-continent model consisting of Africa-Eurasia, the Americas, Antarctica and Australia. 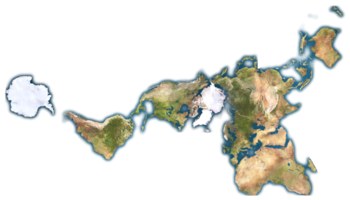 Animated map shows the dissipation of the Bering land bridge which once united Asia and the Americas. When sea levels were lower during the Pleistocene ice age, greater areas of continental shelf were exposed as dry land, forming land bridges. At this time Australia-New Guinea was a single, continuous continent. Likewise, North America and Asia were joined by the Bering land bridge. Other islands such as Great Britain were joined to the mainlands of their continents. At that time there were just three discrete continents: Africa-Eurasia-America, Antarctica, and Australia-New Guinea. The seven-continent model is usually taught in Western Europe, Northern Europe, Central Europe, China, and most English-speaking countries. The six-continent combined-Eurasia model is preferred by the geographic community, Russia, Eastern Europe, and Japan. The six-continent combined-America model is taught in Latin America, the Iberian Peninsula, Italy, Iran, and some other parts of Europe; this model may be taught to include only the 5 inhabited continents (excluding Antarctica). Oceania or Australasia may be used in place of Australia. For example, the Atlas of Canada names Oceania. The first distinction between continents was made by ancient Greek mariners who gave the names Europe and Asia to the lands on either side of the waterways of the Aegean Sea, the Dardanelles strait, the Sea of Marmara, the Bosphorus strait, and the Black Sea. The names were first applied just to lands near the coast and only later extended to include the hinterlands. Ancient Greek thinkers subsequently debated whether Africa (then called Libya) should be considered part of Asia or a third part of the world. A division into three parts eventually came to predominate. From the Greek viewpoint, the Aegean Sea was the center of the world; Asia lay to the east, Europe to the west and north, and Africa to the south. The boundaries between the continents were not fixed. Early on, the Europe-Asia boundary was taken to run from the Black Sea along the Rioni River (known then as the Phasis) in Georgia. Later, the boundary was viewed as running from the Black Sea through Kerch Strait, the Sea of Azov, and along the Don River (known then as the Tanais) in Russia. The boundary between Asia and Africa was generally taken to be the Nile River. 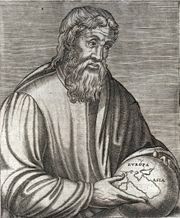 Herodotus in the fifth century B.C.E., however, objected to the unity of Egypt being split into Asia and Africa ("Libya") and took the boundary to lie along the western border of Egypt, regarding Egypt as part of Asia. He also questioned the division into three of what is really a single landmass, a debate that continues nearly two and a half millennia later. Eratosthenes, in the third century B.C.E., noted that some geographers divided the continents by rivers (the Nile and the Don), thus considering the continents to be "islands." Others divided the continents by isthmuses, calling the continents "peninsulas." These latter geographers set the border between Europe and Asia at the isthmus between the Black Sea and the Caspian Sea, and the border between Asia and Africa at the isthmus between the Red Sea and the mouth of Lake Bardawil on the Mediterranean Sea. Through the Roman period and the Middle Ages, a few writers took the Isthmus of Suez as the boundary between Asia and Africa, but most writers continued to take it to be the Nile or the western border of Egypt (Gibbon). 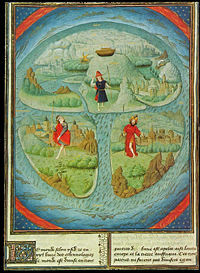 The [inhabitated] mass of solid land is called round after the roundness of a circle, because it is like a wheel… Because of this, the Ocean flowing around it is contained in a circular limit, and it is divided in three parts, one part being called Asia, the second Europe, and the third Africa. In 1501, Amerigo Vespucci and Gonçalo Coelho attempted to sail around the southern end of the Asian mainland into the Indian Ocean. On reaching the coast of Brazil, they sailed a long way south along the coast of South America, confirming that this was a land of continental proportions and that it extended much further south than was known of Asia. Within a few years the name "New World" began appearing as a name for South America on world maps, such as the Oliveriana (Pesaro) map of around 1504–1505. However, maps of this time still showed North America connected to Asia and showed South America as a separate land. 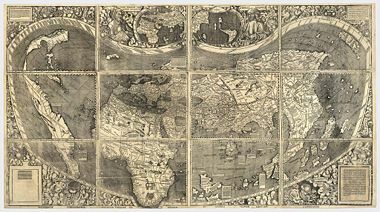 In 1507, Martin Waldseemüller published a world map, Universalis Cosmographia, which was the first to show both North and South America as separate from Asia and surrounded by water. A small inset map above the main map explicitly showed for the first time the Americas being east of Asia and separated from Asia by an ocean, as opposed to just placing the Americas on the left end of the map and Asia on the right end. 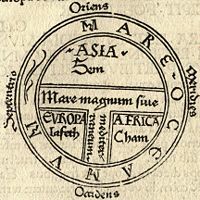 In the accompanying book Cosmographiae Introductio, Waldseemüller noted that the earth is divided into four parts, Europe, Asia, Africa, and the fourth part which he named "America" after Amerigo Vespucci's first name. On the map, the word "America" was placed on part of South America. From the 1500s, the English noun continent was derived from the term continent land, meaning continuous or connected land. It was not applied only to very large areas of land. In the 1600s, references were made to the continents (or mainlands) of Kent, Ireland, and Wales, and in 1745 to Sumatra. The word continent was used in translating Greek and Latin writings about the three "parts" of the world, although in the original languages no word of exactly the same meaning as continent was used. While continent was used on the one hand for relatively small areas of continuous land, on the other hand geographers again raised Herodotus’s query about why a single large landmass should be divided into separate continents. In the mid 1600s, Peter Heylin wrote in his Cosmographie that "A Continent is a great quantity of Land, not separated by any Sea from the rest of the World, as the whole Continent of Europe, Asia, Africa." In 1727 Ephraim Chambers wrote in his Cyclopædia, "The world is ordinarily divided into two grand continents: the old and the new." Emanuel Bowen, in his 1752 atlas, defined a continent as "a large space of dry land comprehending many countries all joined together, without any separation by water. Thus Europe, Asia, and Africa is (sic) one great continent, as America is another." However, the old idea of Europe, Asia, and Africa as separate "parts" of the world ultimately persisted, and these terms continued to be regarded as distinct continents. From the late-eighteenth century, some geographers started to regard North America and South America as two parts of the world, making five parts in total. Overall though the fourfold division prevailed well into the nineteenth century. Europeans discovered Australia in 1606 but, for some time, it was taken as part of Asia. By the late-eighteenth century, some geographers considered it a continent in its own right, making it the sixth (or fifth for those still taking America as a single continent). 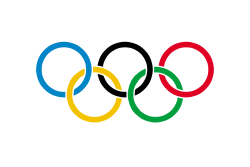 The Olympic flag's five rings represent the five inhabited continents with the Americas counted as one. Antarctica was sighted in 1820 and described as a continent by Charles Wilkes on the United States Exploring Expedition in 1838, the last continent to be identified, although a great "Antarctic" (antipodean) landmass had been anticipated for millennia. An 1849 atlas labeled Antarctica as a continent, but few atlases did so until after World War II. From the mid-nineteenth century, United States atlases more commonly treated North and South America as separate continents, while atlases published in Europe usually considered them one continent. However, it was still not uncommon for United States atlases to treat them as one continent up until World War II. The Olympic flag, devised in 1913, has five rings representing the five inhabited, participating continents, with the Americas being treated as one continent and Antarctica not included. From the 1950s, most United States geographers divided the American continent in two, consistent with the modern understanding of geology and plate tectonics. With the addition of Antarctica, this made the seven-continent model. However, this division of America never appealed to Latin America, which saw itself spanning an America that was a single landmass, and there the conception of six continents remains, as it does in scattered other countries. However, in recent years, there has been a push for Europe and Asia—traditionally considered two continents—to be considered one single continent, dubbed "Eurasia." In this model, the world is divided into six continents (if North America and South America are considered separate continents). Geologists use the term continent in a different manner than geographers, where a continent is defined by continental crust: a platform of metamorphic and igneous rock, largely of granitic composition. Some geologists restrict the term "continent" to portions of the crust built around a stable Precambrian "shield," typically 1.5 to 3.8 billion years old, called a craton. The craton itself is an accretionary complex of ancient mobile belts (mountain belts) from earlier cycles of subduction, continental collision, and break-up from plate tectonic activity. An outward-thickening veneer of younger, minimally deformed sedimentary rock covers much of the craton. The margins of geologic continents are characterized by currently active, or relatively recent active mobile belts and deep troughs of accumulated marine or deltaic sediments. Beyond the margin, there is either a continental shelf and drop-off to the basaltic ocean basin, or the margin of another continent, depending on the current plate-tectonic setting of the continent. A continental boundary does not have to be a body of water. 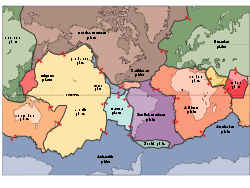 Over geologic time, continents are periodically submerged under large epicontinental seas, and continental collisions result in a continent becoming attached to another continent. The current geologic era is relatively anomalous in that so much of the continental areas are "high and dry" compared to much of geologic history. Some argue that continents are accretionary crustal "rafts" which, unlike the denser basaltic crust of the ocean basins, are not subjected to destruction through the plate tectonic process of subduction. This accounts for the great age of the rocks comprising the continental cratons. By this definition, Europe and Asia can be regarded as separate continental masses because they have separate, distinct ancient shield areas and a distinct younger mobile belt (the Ural Mountains) forming the mutual margin. Plate tectonics offers yet another way of defining continents. Today, Europe and most of Asia comprise the unified Eurasian Plate which is approximately coincident with the geographic Eurasian continent excluding India, Arabia, and far eastern Russia. India contains a central shield, and the geologically recent Himalaya mobile belt forms its northern margin. North America and South America are separate continents, the connecting isthmus being largely the result of volcanism from relatively recent subduction tectonics. 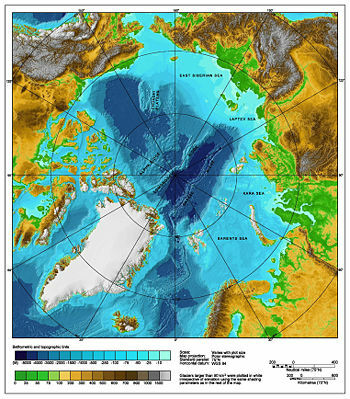 North American continental rocks extend to Greenland (a portion of the Canadian Shield), and in terms of plate boundaries, the North American plate includes the easternmost portion of the Asian land mass. Geologists do not use these facts to suggest that eastern Asia is part of the North American continent, even though the plate boundary extends there; the word continent is usually used in its geographic sense and additional definitions ("continental rocks," "plate boundaries") are used as appropriate. ↑ Farley Brewer Goddard, "Researches in the Cyrenaica." The American Journal of Philology 5 (1)(1884): 38. Goddard, Farley Brewer. "Researches in the Cyrenaica." The American Journal of Philology 5 (1) 1884.